It’s a beautiful day in Colorado and I’m getting a crash course in birding while riding an Amtrak train hustling along at 79 miles per hour. Anytime something flaps by the floor-to-ceiling window, I shout, “There!” and the two strangers turned my friends, Ron and Chris (an 80-something father and his son who are avid birdwatchers, mountain climbers, and all-around hobbyists extraordinaire), immediately identify the bird based on color, flight pattern, and a thousand other nuances. They’ve spotted a great blue heron, a white pelican, and a western bluebird. More than once I mistake fenceposts for having wings. After riding a train for 24 hours, your surroundings start to look fuzzy—or, in this case, feathery. In late May I boarded the California Zephyr in Sacramento, to travel cross-country in four days to New York City, where I live (with one switch in Chicago). Reservations were painless: I booked my ticket only two weeks before. I hadn’t expected to be stupefied by nature and engaged in four-hour conversations. Yet here I was, somewhere near Boulder, Colorado: stupefied, engaged, loving it. Based on my observations, Amtrak attracts the curious, the talkative, the eccentric, the spontaneous—and Richard Dreyfus. In November, he live-tweeted his own father-son cross-country trip. It’s probably too much to ask for Mr. Holland’s Railway Opus; train travel has been romanticized hundreds of times before in books, TV, and films. Riding Amtrak these days is exactly as depicted in North by Northwest: every man I encountered was the spitting image of Cary Grant, every woman was Eva Marie Saint. But in their 80s. Many people I met were retired, which meant conversations didn’t open with “What do you do?” Instead it was “Where ya going?” and “Where are you from?” and they cover the good stuff: travel, culture, family. In fact, family inspired my own trip. My beloved grandparents Al and Dorothy still talk about hopping aboard their California-to-Pittsburgh train the day after their wedding to see his relatives. Apparently a honeymoon in coach—“feet swelling because we couldn’t walk around outside,” my grandmother says—was their idea of a good time. They’ve been married 63 years, and I thought it only right to follow in their tracks (though I bought a sleeper for another $400, which means a private room and actual bed at night). Another realization: You’re traveling with dozens of Dear Abbys (or Abes). While hanging out in the lounge car, Steve, who’s goateed and wearing a bright orange vest, tells me to never get married. He was for three years and brought home the money and did all the housework, too. “I wanted her to do one thing for me,” he says, “and she couldn’t do it.” He pauses for five hours, about how long it takes to creep through Nebraska. “I wanted her to have dinner ready for me when I got home every night. She couldn’t do it,” he says. Reasonable, I think. But a stranger on a train is a master of the one-sided story. With only nine cars to choose from, wandering end to end isn’t going to fill up a day. But settling into the Sightseer car, made up nearly entirely of windows and reclined seats facing those windows, makes the hours fly. It’s first come, first served. Laptops are rare (the California Zephyr doesn’t have Wi-Fi) but unnecessary anyway when surrounded by people who know every bird or lake or mountain range or why there are so many dead trees in Colorado. (Answer: that dastardly mountain pine beetle.) People read paperbacks, play cards, and introduce themselves. The vibe is relaxed and happy. After shuttling through Ottumwa, Iowa; Galesburg, Illinois; and 28 other towns on the way to Chicago, the time comes to disembark the California Zephyr and say hello to 20 hours on the Lake Shore Limited. Gone are the countryside and farmland. I receive a long and green education on the immense girth of New York. On this trip, most people seem to be traveling out of necessity instead of for pleasure. Everyone naps. Arriving at Penn Station four days after leaving California, my fellow passengers and I are greeted by a teeming, steaming hell of people leaving the city on a summer Friday. They want out—to Sag Harbor, Shelter Island, Amagansett. “Go west!” I want to shout. 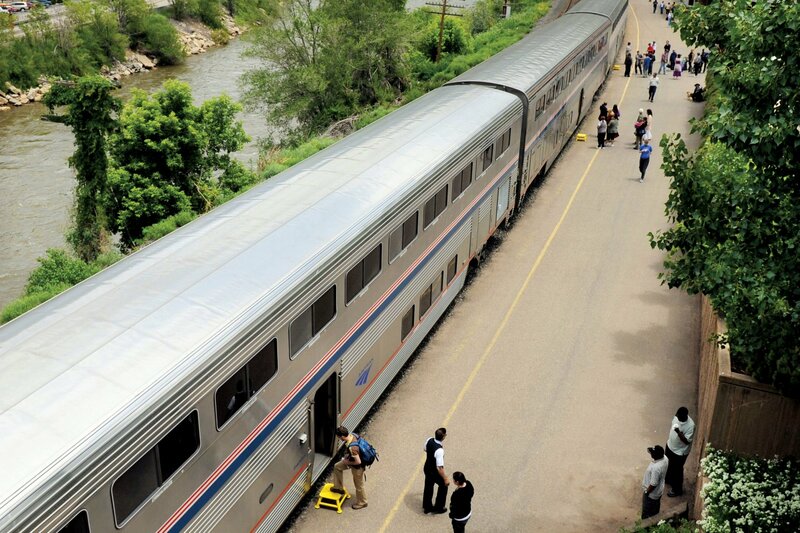 If not on the California Zephyr, then how about the Empire Builder, which snakes from Chicago to Seattle and Portland? I remember Ron, my favorite birdwatcher and railway connoisseur, saying that on that train the views of Montana can’t be beat—plus, they serve thick pancakes and dust the Amtrak logo on them in sugar.